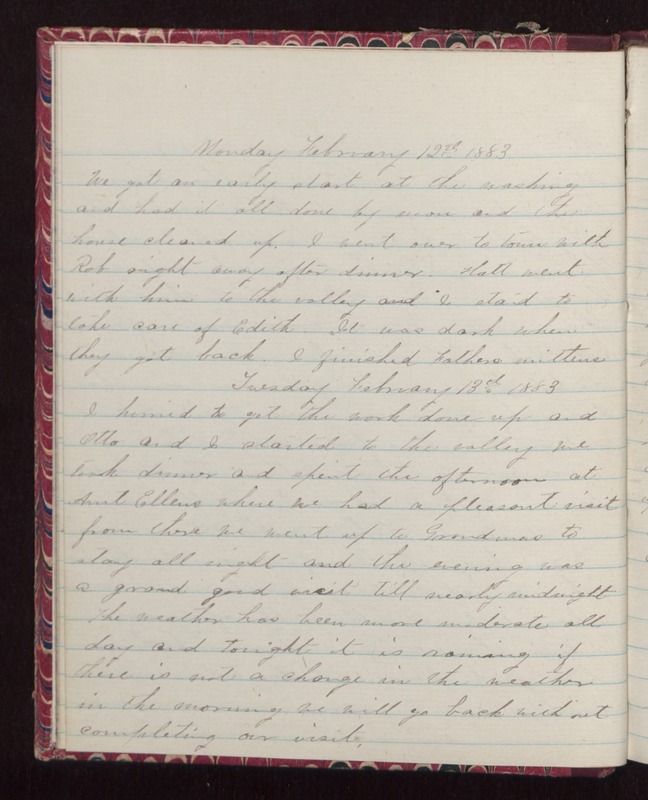 Monday February 12th 1883 We got an early start at the washing and had it all done by noon and the house cleaned up. I went over to town with Rob right away after dinner. Hatt went with him to the valley and I staid to take care of Edith. It was dark when they got back. I finished Fathers mittens. Tuesday February 3th 1883 I hurried to get the work done up and Otto and I started to the valley We took dinner and spent the afternoon at Aunt Ellens where we had a pleasant visit from there we went up to Grandmas to stay all night and the evening was a grand good visit till nearly midnight The weather has been more moderate all day and tonight it is raining if there is not a change in the weather in the morning we will go back with out completing our visit.